Halloween isn’t just about giving away candy to children in costume. 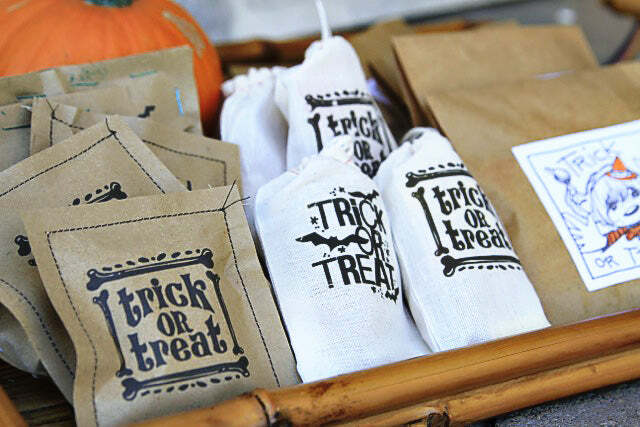 It’s about giving away in such an awesome manner that you become the envy of the neighborhood – and these super-cool DIY treat bags will help you do just that. We’ve gathered our favorite treat bag tutorials from around the net to create the most comprehensive guide on sprucing up your candy distribution system you’ll see all season. From adorable owls to spooky witches’ brooms, these nine awesome DIY goodie bags are sure to make your house the stuff of Halloween legend. So break out your glitter tubs and glue guns, because we’re about to get all sorts of crafty up in here. These owl treat bags from Chica Circle are a real hoot to give out to trick-or-treaters (pun most definitely intended). And thanks to Club Chica member Pauline Molinari, they’re also incredibly easy to make. 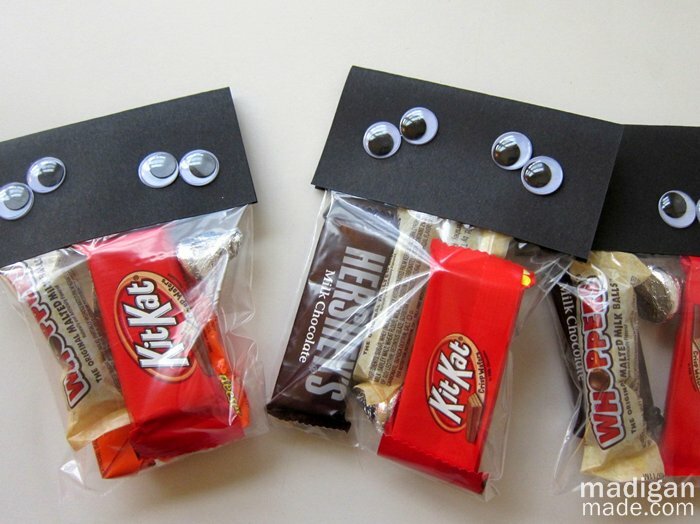 Just visit the website, print out the free templates, cut “˜em up and staple them to some clear candy bags. They’re so darn cute that everyone who visits your house will be left in “aww” (pun intended there as well). #2. Hot Cocoa and Cider Goodie Bags. Are you getting tired of putting out the same bowl of Hershey’s Kisses every year? 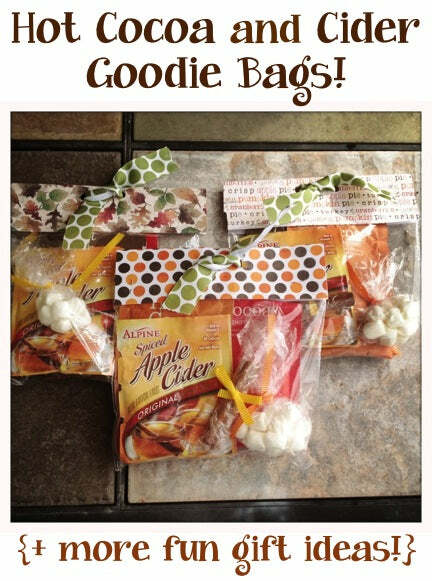 Then mix things up with these awesome Hot Cocoa and Cider Goodie Bags from The Frugal Girls. By combining individual packets of hot cocoa, cider and marshmallows with some cinnamon sticks, you can create a safe and delicious DIY treat that both kids and parents are sure to love. #3. The Easy Halloween Gift Bag. These Easy Halloween Gift Bags by Madigan Made might not be fancy, but they have a lot going for them. They’re cute, they’re useful for portioning your candy giveaways and, as the name implies, they’re super easy to make. Just pick up some clear candy bags from your local craft store, fill them with chocolates, staple on some black construction paper and glue on some googley eyes and you’re good to go. #4. Creepy Crawly Play Dough Spiders. If these fuzzy spider Play Dough tubs from Better Homes and Gardens aren’t the cutest Halloween giveaway you’ve ever seen, then they ought to be near the top of the list. 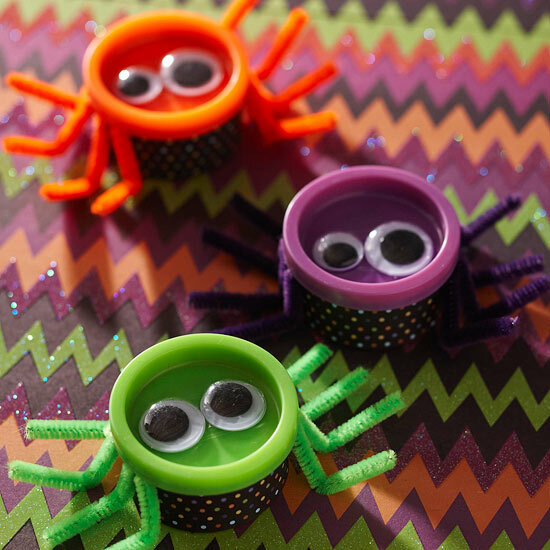 With huge eyes, colorful wrapping paper bodies and fuzzy pipe cleaner legs, they’re sure to be a hit with younger trick-or-treaters – and they’re pretty fun to play with, too. #5. Batty Halloween Treat Holders. Bats and Halloween go together like chocolate and peanut butter. 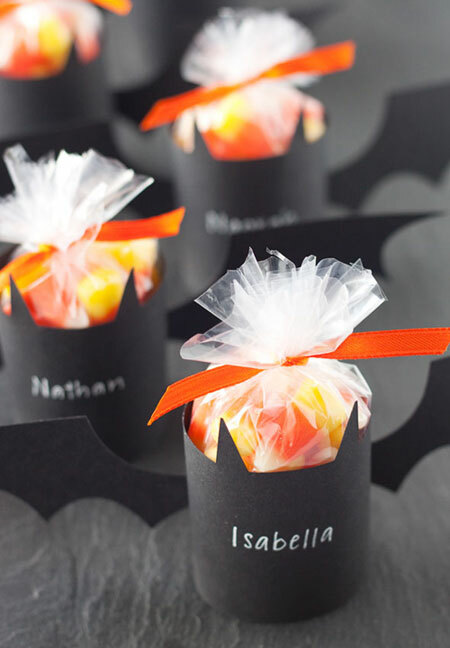 Coincidentally, these Batty Halloween Treat Holders from Simply Modern Mom happen to be the perfect vessels to hold the chocolate and peanut butter treats you hand out this year. All you need to make them is some black construction paper and a steady hand with an X-ACTO knife. #6. Cartoon Monster Treat Bags. 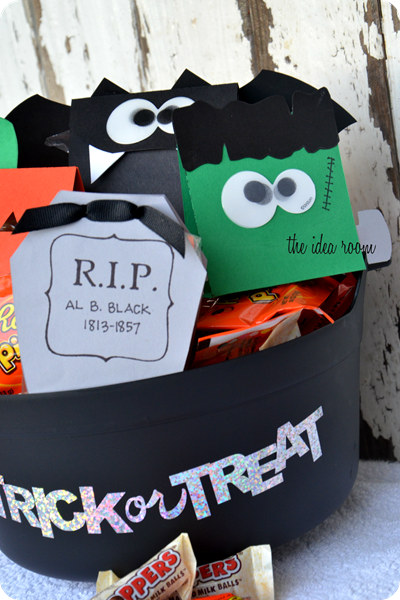 These treat bags from Eighteen25 are another shining example of how a little creativity can be used to turn plain old construction paper into awesome Halloween goodies. With comical features and a clever use of negative space, these snack sacks are sure to be a hit on All Hallows Eve. Don’t worry if your crafting skills are a little rusty, either. The project’s creator, Amy Huntley, has provided templates for each bag design online. Simply print them out and cut along the dotted lines and you’ll be all set to distribute your Halloween haul. There’s nothing like coming home from a long night of trick-or-treating, cracking open an old skeleton hand and devouring the marrow – at least not when the marrow is chocolate and the hand is really a cleverly disguised rubber glove. This treat bag, courtesy of Holiday Crafts and Creations, is frighteningly easy to make thanks to the free skeleton-hand printout that the website provides. You can fill the hands with all sorts of goodies, from chocolate coins to candy corn, and you can even accent them with a novelty spider ring if you’re feeling particularly fancy. We have to hand it to you, Holiday Crafts and Creations, you really know how to make a cool gift bag (see what we did there?). #8. Sewn-up Halloween Treat Sacks. Do you have a knack for sewing? Then you need to check out these awesome treat sacks by Lil’ Blue Boo. They’re not the easiest bags on this list to make, but they might very well be the coolest. Whip out your Singer machine and follow the online tutorial – which includes a free printable graphic – and you should be able to knock out a few dozen of these awesome candy parcels in just one afternoon. #9. 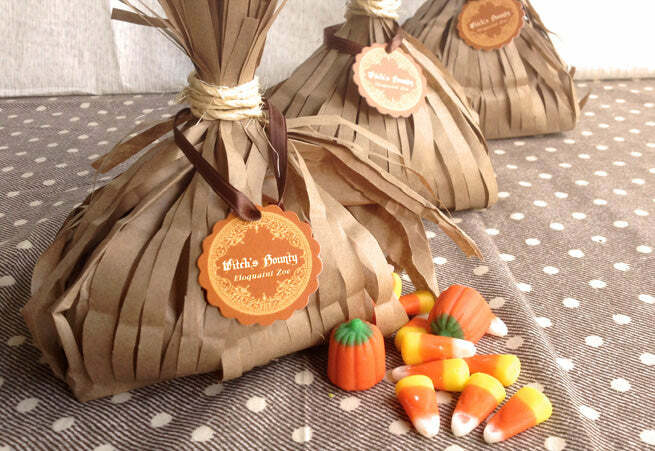 Witch’s Bounty Treat Bags. There’s no better way to dole out candy this Halloween than with treat bags that look like witches’ broomsticks. 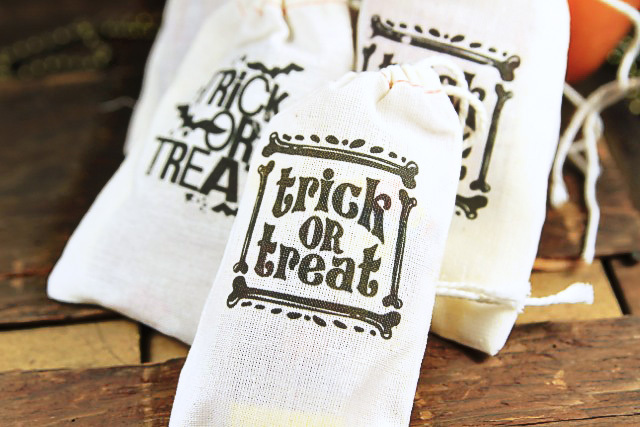 These Witch’s Bounty Treat Bags, which come to us courtesy of Zoe at My Own Labels, might look professional but they’re so simple to make that any novice crafter should be able to whip up a batch of their own in no time. You just need some brown paper bags, some twine and a few sticks out of your back yard. Pro Tip: If you happen to live in an area where twigs are hard to come by, feel free to use oversized pretzel sticks instead. They’ll look just as good, plus you can eat them! 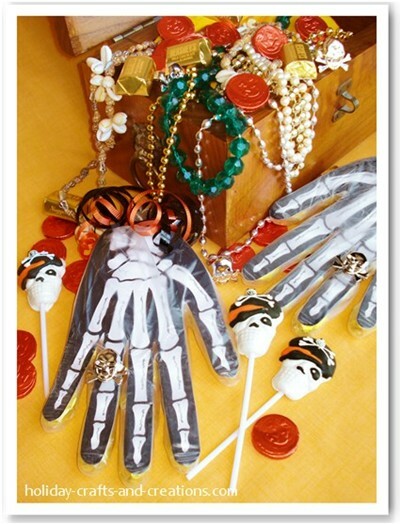 Got a Great Idea for a Halloween Gift Bag? Let Us Know! 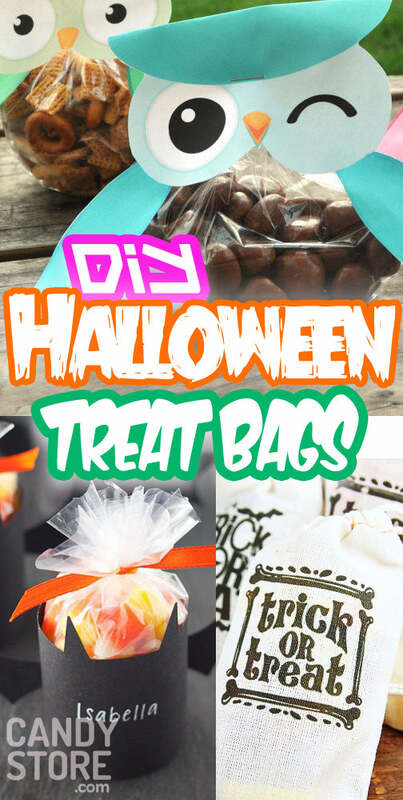 Do you have an awesome idea for a Halloween treat bag? Feel free to post it in the comments below. We’d love to see what you can come up with, and if it’s really good we might share it with all of our readers on the ACS Blog! What a great roundup! Thanks for featuring the Club ChicaCircle Owl Treat Bags!! No problem! Thanks for giving us an awesome treat bag printout to share with our readers!